The StudioLive 16.0.2 USB is a great choice for small churches, schools, bands, and clubs, and it’s perfect for a small studio on a budget. It features 16 channel inputs, 4 of them stereo channels, and 12 with XMAX mic preamps; a built-in 18x16 USB 2.0 interface; extensive signal processing on every channel and bus; 4 aux buses; extensive metering; Scene and setting save/recall; MIDI control; and more. Yet it’s lightweight and rack-mountable, operates much like an analog console, and delivers superb audio quality. 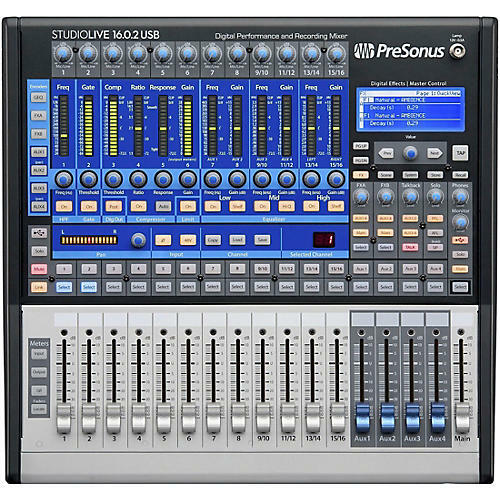 It comes with PreSonus’ UC Surface control software, Capture recording software, QMix-UC aux control app, and Studio One Artist DAW. Software library includes PreSonus Studio One Artist DAW and Capture live-recording software for Mac and Windows® and UC Surface mixer-control software for Mac, Windows, and iPad. QMix-UC touch wireless aux-control software for iPhone, iPod touch, and Android are also available free.